We’ve said it before and we’ll say it again, don’t take things that don’t belong to you. Apparently, Mr. Jackson did not listen. 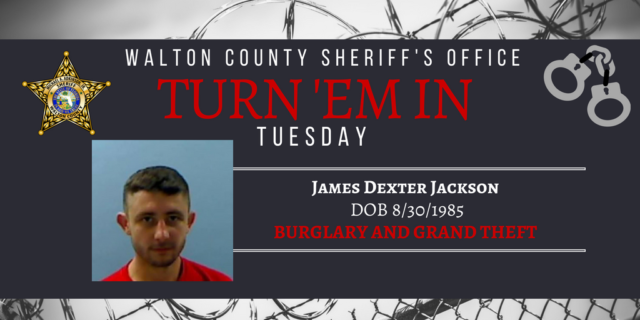 James Dexter Jackson, 32, currently has active warrants for burglary of a structure, grand theft of more than $20,000 and grand theft of a motor vehicle. Walton County Sheriff’s Office has been trying to get in touch with him, but he’s been avoiding us for the last couple of days. If you have any information on the whereabouts of Mr. Jackson, please call the Walton County Sheriff’s Office at (850) 892-8186 or you can remain anonymous by calling Emerald Coast Crime Stoppers at (850) 863-TIPS. Submit a web tip at http://www.emeraldcoastcrimestoppers.com/ or send a mobile tip using the P3 Tips Mobile Application.